If we eat out too much during the week, it really adds up. We drop $50 easy on a drive through and our bill at a sit down restaurant is always $100. If I do not meal plan, our weeknights are a mess. It just trickles down and affects everything. 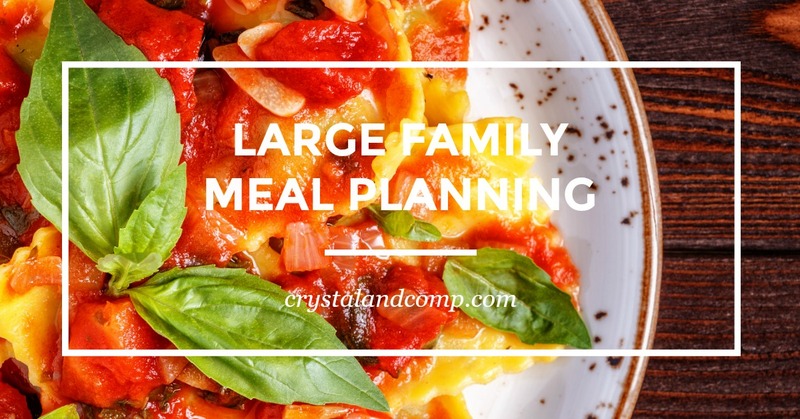 Here is our large family meal plan. I always shop my pantry, fridge and freezer first. Then the other items I need I order using online grocery shopping at Walmart. I will share more of these details with you in my meal plan below. Black Bean Chicken Rice Bowls– these are so easy and delicious to make. 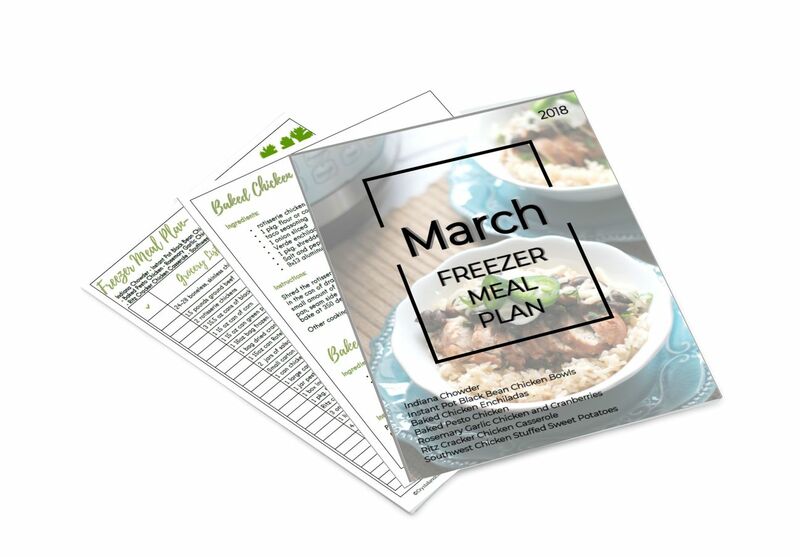 The recipe for the chicken and black beans is included in the March freezer meal plan. I make them in my 6 quart InstantPot. The brown rice I make in the InstantPot ahead of time, or if the pressure cooker is full with the chicken I will just make the rice on the stove top. I also like to save any leftover rice and freeze it. I add to the freezer bag as we have leftover rice through out the month or the week. Then I can easily pull it from the freezer on a night that I need rice and heat it up in the microwave. It also adds easily to soups and casseroles. Creamy Chicken Taco Pasta– I have seen this on Pinterest many times and decided to add it to my meal plan. I already have everything needed to make this except the heavy cream. I have diced up Zaycon chicken breasts in the freezer. Can’t wait to try this! Rosemary Garlic Chicken with Cranberries– I cannot wait to make this. I am going to bake it in the oven. This was another one of our March freezer meals. I am going to make rolls (I grabbed a big bag of these a few weeks ago when I did my online shopping order at Walmart. If you have not given this a try you are seriously missing out. This has CHANGED my life! And if you place your first order using my link you get $10 off your first order!) I am going to make diced potatoes along with the dinner rolls. Crockpot Ravioli– this was part of the February freezer meal plan, but we already used that one and I am making it again. The boys love this! Served with salad and french bread. I even have some leftover spaghetti sauce in the freezer that I will use! The Perfect Omelet– these are awesome and perfect for each person to customize. We have lunch meat, veggies, cheese, etc. Everyone loves breakfast for dinner! Leftover Buffet– I shared with you guys a few weeks back that I purchased 40 pounds of chicken breasts from Zaycon. Have you ever ordered from them before? You buy in bulk, trim them up a bit and portion them out. I did 5 large breasts per freezer bag. Let me tell you, these breasts are huge and they go super far. I will have enough leftover chicken from the week from each meal and I will use the chicken from the black bean bowls and the taco pasta to make leftover chicken nachos one night for dinner. 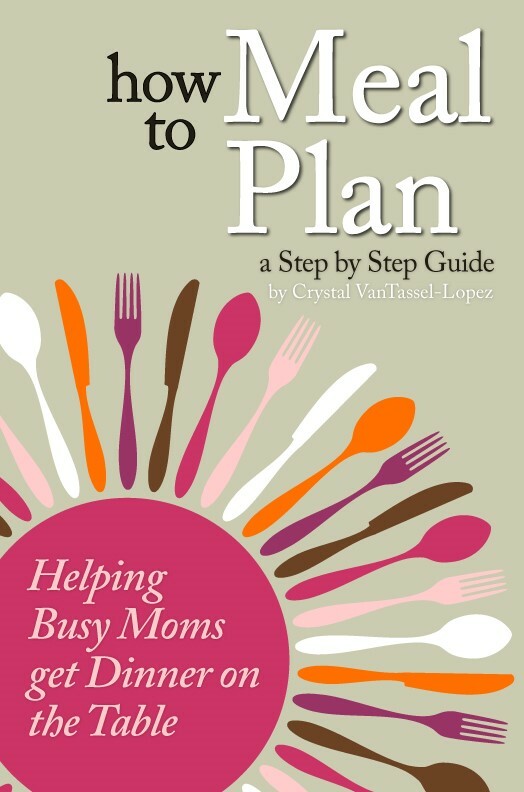 Here are my best resources for helping you get dinner on the table. Give Freezer Cooking a try. Follow my 5 step guide on how to meal plan.